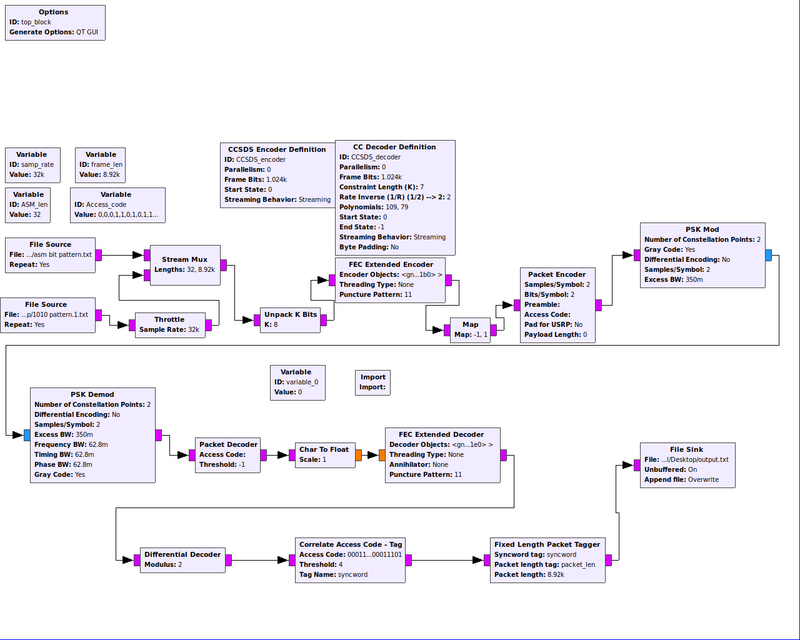 Please find attached screenshot of GNU flow graph for CCSDS TM transmitter and receiver, in which I have used correlate access code-tag block in order to trigger at CCSDS sync bits and produce tags which is followed by custom block from gr-satellites fixed length packet tagger block in order to extract that sync bits from payload and provide payload file in file sink. that means, there may be an issue to correlate access code-tag block. Can anyone please guide me where am I doing wrong? I have also tried by attaching time sink at the output of correlate access code-tag block and by right clicking the time domain spectrum and selecting trigger-mode-tag , but after executing, following is the message. but not trigger at the tag. I have GNU radio version: 3.7.13.4 in windows OS.